Question: We know that one component that refers to the “speaking” degree of nature equals the sum of all components of the animate degree. In that case, if there is just one living Kabbalist in our generation, why should we all strain ourselves? Answer: In order for one such person to appear, all the others must exert themselves. After all, neither Moshe (Moses), nor Abraham, nor anybody else could reach full correction of the world because humanity hasn’t yet undergone the process of mutual interconnection. The Israel (straight to the Creator) souls have to connect with the souls of the nations and mix with them to such an extent that on the inner level, there won’t be any difference between them. We can’t see it, but, as of today, it has been done. Look how many people from the nations of the world are waking up to correction. Why would they? This is taking place because of the mutual inter-inclusion of the souls. In order to accomplish this, it was necessary to undergo all phases of exile and especially the last one. This is why, today, the points in the heart are emerging. Only we, now, after having completed the entire process of mutual inclusion, are able to perform the corrections. If we make an effort all together, then we will surely become one soul. When you hear that the corrections will be done by someone, it means that we will become as one, and we all will obligate him to include himself into all. In other words, one is the same as all, and this is what mutual inclusion is all about. A group is not a union of individuals but a union with the Creator; otherwise, it is not a Kabbalistic group. I come to this group exactly because the Creator resides within it; if not, why do I need all these people? People always unite by interests, and what can a Kabbalistic group give us? It can give us the Creator! And this is the only reason I come here, in order to find Him in the connection between us. This is regarded as: “Israel (I, who aspires to the Creator; Isra– directly, El– the Creator), the Light of correction (the Torah), and the Creator (the root of all) are one.” All three of these components must become one in order for me to achieve them. This is the reason I come here, and it defines all actions I perform in the group, as well as my attitude to the friends, and absolutely everything else! It turns out that I relate to this very notion of the group as to the Creator because He resides there within it! But I am not able to focus my eyes on Him. He keeps getting blurry for me, and I don’t know where He is. I can’t catch him with my targeting device. Yet, I am told that if I look at it through the group, it is aimed precisely at Him, with the result correctly targeted. Therefore, I value the friends as much as I value the Creator; after all, only through them am I able to reach Him. Besides, it is written: “From the love of created beings to the love for the Creator.” In other words, if I achieve love in the group, then as a final result, I will undoubtedly reach Him and attain love of the Creator. I can’t work on love in relation to the Creator since I don’t see whom I must work with. Therefore at each stage, I attain love for the Creator by working on love for the group. Otherwise, I cannot study the Creator: I imagine Him according to my correct attitude to the unity with friends. I build and uncover this form myself. If not, why do I need to come in the group? I do so only because they are selected by the Creator so that through them I could approach Him. That is why I love them! They are my salvation! Laitman.com Post: Can You Cook A Burger? All of Israel are responsible for one another (Sanhedrin, 27b, Shavuot 39). 1. The key is to keep in mind that between us (the souls) there is an eternal system of connection. Initially we are unified, and each of us is indebted to the other. There is no freedom in this, because we are initially interconnected and interdependent. Moreover, this holds true not only for Israel, but for the entire world. 2. If we wish to ascend to the spiritual degree of the revelation of the Creator, we must learn the law of connection working in this network and implement it. 3. “Israel” is a small group that decided to learn the law of connection by having aimed straight to the Creator. The name “Yisrael” means “Yashar-El” or directly to the Creator. In Abraham’s time, it was a group of Babylonians who left the general mainstream of development, by separating and distancing themselves from its ideological views. Today it is not the nation of Israel, but a part of humanity (the modern Babylon) reaching the same decision. Ultimately, all of humanity will join this goal. 4. The main rule in attaining the Creator is the condition of mutual group guarantee (Arvut). We must truly agree to meet it by way of the process called “We shall do, and we shall hear.” We will do everything in our power to do, and consequently, we will “hear” or reach the state of guarantee. Having met this condition, we uncover the correct connection between us all and become “as one man with one heart.” Finally, the Torah, the method of correction of human nature (egoism), becomes revealed to us. 5. Essentially, Arvut (mutual guarantee) is a very simple thing: I receive from the influence of the group such a strong feeling of certainty and security that I stop thinking about myself completely. If I were a king, I would have money, healers, and an army at my disposal, but none of it would give me such assurance. However, thanks to the total interconnectedness of souls, a person’s desire is assured to be fulfilled and at rest if everyone is thinking about its fulfillment. 6. Wealth and power are useless here; besides, the fellow-guarantors do not have anything to fill me with. And yet, with the collective thought and caring, the friends will open the channels for the Light, and it will flow to me through them. My soul’s desire will feel satiated; it will stop fearing emptiness and demanding fulfillment, giving me an opportunity to rise above it and to start bestowing to the others without thinking about myself. Hence, aspiring to the Creator is a required pre-condition, and aspiring to the friends is needed as the condition for attaining the Creator. By acting upon us, the Light divides within us the receiving and bestowing desires, and we start feeling rejection between them. It becomes clear that the bestowing desires gravitate to a different perception and fulfillment from those of the receiving desires. Each of us possesses desires of both kinds, and the question is which of them prevail. In the souls regarded as “Israel,” the bestowing desires, GE (Galgalta Eynaim), rule over AHP (Awzen, Hotem, Peh), whereas in the souls of the “nations of the world,” the receiving desires, AHP, rule over GE. The first type of souls is closer to the Light which illuminates them with Ohr Makif (OM) and causes them to undergo corrections first. Until “Israel” corrects itself, it is impossible to begin correction of the “nations of the world.” First, “Israel” corrects itself in GE (the right line), then adjoins AHP (the left line) to it, and finally builds the middle line from them, thus correcting the “nations of the world” within itself. As a result, “Israel” is able to continue the correction of the collective group, the “nations of the world,” since its corrected Kelim (vessels) are connected with the uncorrected Kelim of the rest of the souls waiting in line. Work in the two lines with the receiving and bestowing Kelim, in their correct combination creates the middle line. Such are the steps of our correction in both parts of the collective soul. Furthermore, major corrections take place in AHP or the receiving Kelim of the “nations of the world” whereas GE that initially descended from Bina exist in AHP solely in order to correct it. Hence, all our corrections that precede the correction of the “nations of the world” in the collective soul are merely a preparation. When we read The Book of Zohar, we try to create a common space where we aspire to connect our points in the heart. This is the meaning of “studying the Torah.” It’s impossible to "study the Torah" without such an intention. The point in the heart is “Israel.” "Isra-El" translates as “aspiring to the Creator.” Through the study, we want to attain the Torah: the Light that corrects us. Then, we reveal the Creator in the connection between us. In that connection and, accordingly, in revealing the Creator, there are 125 degrees, or 5 worlds, 5 Lights of NaRaNHaY. This is how the entire system of the common Soul, called Adam Ha Rishon, Shechina, or Malchut of Infinity is revealed. The form of this spiritual vessel (Kli) is called “the Creator” (Kadosh Baruch Hu): the quality of love and bestowal. Everything exists within this system. The entire science of Kabbalah speaks only of how to reveal the Creator in accordance with the law of equivalence of form, as it is written, “From love of the created beings to love of the Creator.” By uniting together, we create a system between us which matches the Upper Force of bestowal. This is the picture we must always have in our heads when we read The Book of Zohar. I must always check where I am on this ladder of connection between us, what The Zohar speaks of right now, whether I want to unite with others or I resist, and what is it that’s stopping me. The whole time I think of one thing only: how I (Israel) am connected with the others through a force which unites us (the Torah). Within our correct connection, I reveal the true quality of bestowal: the Creator. In November 2010 we will be holding an International Kabbalah Convention in Tel Aviv, Israel where all those studying Kabbalah with us in Israel and the whole world will come together. It will be three days of unity! The main reason why we organize such conventions is that the Kabbalists instruct us to hold meetings and conventions in order to unite. Rabash and Baal HaSulam write about this, but it follows even from the compositions of the Ari and Ramchal, as well as the writings of Rabbi Shimon and Abraham. Correction takes place only by virtue of a connection among the souls, and connection starts with communication. Yet, there is one idea present in the communication: to attain the kind of unity that is called “the Creator,” bestowal, or the spiritual world. Within this kind of unity we reveal the worlds (Olamot). They go from being concealments (Alamot) to revelation and therefore the Creator becomes revealed more and more instead of hiding behind the worlds or concealments. In other words, in the connection between us we reveal bestowal and love more and more, and that is called the revelation of the Creator. When this quality becomes revealed between us, we begin to feel that we live and exist inside it, and thus we ascend above the sensation of this world. The revelation of the Creator can be attained on the condition that we carry out actions within the framework of this world. We start here and then continue the actions in the spiritual realm which becomes revealed in the connection between us. That is why it is necessary for us to meet and unite in this way using all the opportunities that this world has for us, physical or virtual, in order to build closer connections. We would like to announce this event to everyone and to connect as many people as possible to it without any limitations. Any person from any corner of the world can attend and participate if he feels attracted to this idea. The task of those studying with Bnei Baruch is to prepare this convention, but the convention itself is intended for anyone wishing to attend! From Rabash’s article “The Matter of Root and Branch”: It is important to separate the internal from external. An external branch has to match its spiritual root, but an internal branch can abide without its external root. In order for “the Land of Israel,” which originates from its spiritual root “Malchut” (the Creator’s governance), to set in the human heart, it is not necessary to physically be in the Land of Israel. A person may be granted the Creator’s presence (Shechina) and be worthy of great attainment while staying outside Israeli boarders like all great Kabbalists who lived abroad. “Internal” stands for the work in the heart that has nothing to do with “external.” But at the same time, “external” is also extremely important. For example, there is a law that one should pray in a “Minyan” (ten men), but it is redundant to check on the level of spirituality they have attained; any ten men can pray and read from the Torah. But nine perfect, righteous men are prohibited from praying together. Material actions (“branches”) shouldn’t be confused with corresponding spiritual actions (“roots”). Earthly actions (traditions of this world) have nothing to do with the spiritual level of a person and by no means can define it. Anybody can bring sacrifices to the Temple, but only a few are able to make “spiritual sacrifice,” meaning the correction of their egoistic desires by the Upper Light. Any person is able to distinguish between those desires that can be shifted into bestowing ones (“sacred”) and raised to the level of bestowal (“Temple”), meaning to raise Malchut to Bina. Malchut stands for a “house,” Bina for “sanctity.” Malchut rises to Bina, thus creating a “House of Sanctity” (a Temple) in Bina. All “internal” actions that a person performs within the property of Bina are called “sacrifice.” With the help of the Light, a person manages to transform his “inanimate,” “vegetative,” and “animate” desires into altruistic, “speaking” level desires. 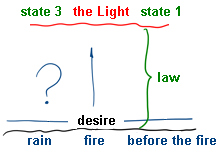 The correction of each desire happens consecutively by undergoing three impacts of the Light: “Kohen,” “Levi,” and “Israel,” thus bringing it to similarity and merging with the Creator. It is called “to sacrifice” (Korban), meaning to become closer (Karov) to the Creator. These steps of correction define the spiritual height of a person. Physical implementation of actions that are related to spirituality but look irrational in this material world are called “commandments,” that is, traditions or rituals (Minhag). They don’t depend on the fact as to whether a person has attained spirituality or not, or whether he is planning to make corrections in his spiritual roots. In our world, we can undertake certain material actions that reflect spiritual deeds, but they are in fact just folklore traditions. They do not correct us or our desires and we can determine this by watching people who observe them. In order to correct our desires, we have to connect with the Upper Light which in turn alters them through the intention to bestow.